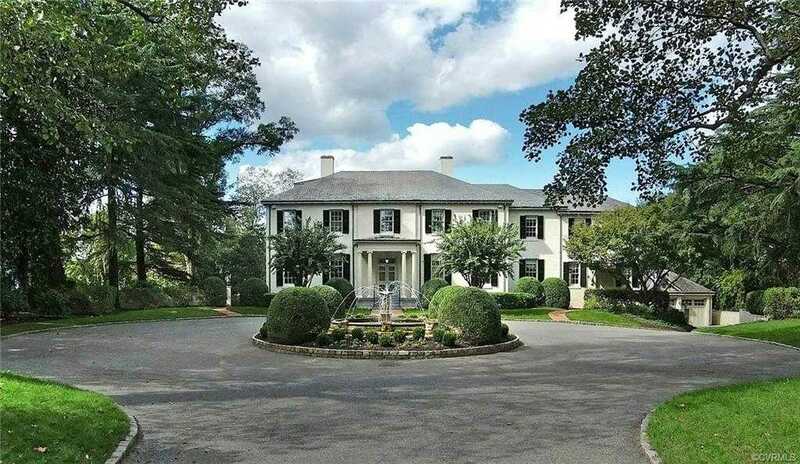 A classic cobble-edged forecourt w/ formal garden and fountain provides entrance to this splendid Georgian Revival estate, located within a sequestered enclave near the James River on a 2-AC hilltop w/ commanding views for miles up the river. Tall ceilings + extraordinary detailing and millwork from original construction in 1941 meld seamlessly with an inspired renovation and expansion by only its second owner, balancing a reverence for the past with a sensitivity to comfortable contemporary lifestyles. Interiors enjoy river views from most rooms and include sumptuous formal rooms, paneled library, kitchen with butler’s pantry opening into a family room with fireplace, casual dining room, and sunroom. An expansive lower level w/ river views includes recreation room with oversized wet bar, office, wine cellar, exercise room and sauna, and home theater with seating for 8. 6 or 7 bedrooms/7 full and 2 half-baths include a gracious master suite with multiple closets, dressing room, and gun closet. A magnificent pool complex encompasses a heated oval pool and octagonal pool house with kitchen and dressing/bathing facilities. 6 fireplaces. 5 or 6-car heated garaging. 55 KW generator. Please, send me more information on this property: MLS# 1837116 – $3,495,000 – 1224 Rothesay Circle, Richmond, VA 23221. I would like to schedule a showing appointment for this property: MLS# 1837116 – $3,495,000 – 1224 Rothesay Circle, Richmond, VA 23221.